Looking for a New Audi TT RS in your area? CarGurus has 308 nationwide Audi TT RS dealers with 6 new car listings. The Audi TT RS, which debuted last year, is the fastest version of Audi’s baby coupe. It carries over for 2019. While Audi does make a TT convertible, you’ll find the TT RS only as a fixed-roof coupe. You can identify the TT RS by the giant front-grille openings, the fixed-wing rear spoiler, and a large set of tailpipes surrounding a sculpted rear diffuser. There’s ample satin silver across the front, rear, and mirror housings, but an optional Black Optic package replaces it with gloss black for a more sinister look. Inside, the TT RS benefits from sport front seats with heavy bolstering and an attractive diamond-quilted upholstery pattern. Like all TTs, the TT RS is a 4-seater, but rear-seat occupants will discover a lack of adequate headroom thanks to the athletic roof line. Still, the rear seats fold to expand on the TT RS’s 12 cubic feet of cargo space. At the heart of every TT RS is a turbocharged 2.5-liter inline 5-cylinder engine, brimming with 394 horsepower and 354 pound-feet of torque. Audi pairs this with a 7-speed dual-clutch automatic transmission (DCT) and an advanced all-wheel-drive (AWD) system that can send available power directly to the rear axle. A magnetic-ride suspension also comes standard. You can select between four drive modes, comfort, auto, dynamic, and individual, to optimize the car’s tuning for specific kinds of driving. The TT RS hits 60 mph in just 3.6 seconds, thanks to the launch-control system, and it even manages fuel-economy ratings of 19 mpg city, 29 highway, and 22 combined on premium fuel. Even in the base trim, the TT RS comes equipped with 19-inch 5-spoke wheels, LED headlights and taillights, keyless access and start, an LCD instrument cluster, satellite radio, a touchpad interface with handwriting recognition, Nappa leather upholstery, and 12-way power front seats with heat. From there, the Technology Package gets you navigation, Android Auto, Apple Play, and a Bang & Olufsen sound system with 12 speakers. You can also specify red brake calipers and a special design package that adds additional leather touch points and red interior accents. A reversing camera, automatic wipers, and parking sensors come standard. The only optional item is blind-spot monitoring, which comes with the Technology Package. Additionally, no external agency has evaluated any of the TT family for crashworthiness, but that’s not unusual for low-volume performance cars. The Audi TT RS takes the brand’s cute and capable coupe and gives it the power and edge to hang with performance cars like the Mercedes-Benz SLC-Class and the Jaguar F-Type. 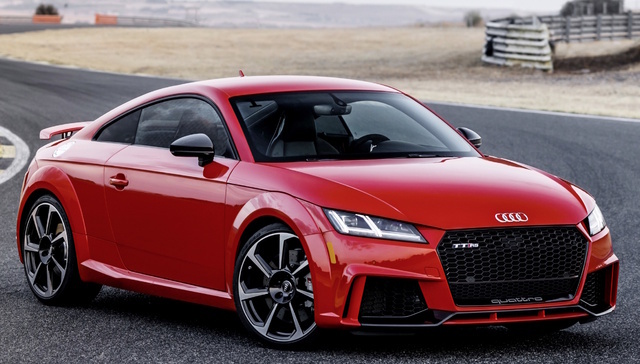 What's your take on the 2019 Audi TT RS? Have you driven a 2019 Audi TT RS? Enter your zip to see incentives for a new TT RS in your area. CarGurus has 28 nationwide TT RS listings starting at $29,900.